I had such a fun weekend! I took Friday off and went with my friend Katie to Collierville, Tennessee. Collierville is about three and a half hours east of Nashville, and was the setting for the movie The Blind Side. We spent the night Friday and picked up Katie's adorable step-daughter the next day for a visit with Katie and her husband. Collierville is such a cute town. We got there Friday afternoon and checked into our hotel. We stayed at the Courtyard Marriott which is at The Avenue Carriage Crossing. Carriage Crossing is a great outdoor shopping area with some great stores and restaurants. After we checked in we headed to the Collierville square, which is a really cute sort of center of the town with old buildings, cute shops, and quaint little restaurants and cafes. We ate lunch and walked around a bit. We stopped at Patricia's, which is a really cute boutique with jewelry, home decor items, baby and kids boutique clothes and toys, women's clothes and accessories, perfumes, lotions, etc. I got a birthday gift and found a jacket that I loved. L.O.V.E.D. It was made by Damee, Inc., and is so cute. It's called the long bubble jacket, and this is the style. I didn't get this print - mine is a salmon color. I debated and debated about it, because it was so cute but a bit expensive. I had them hold it for me so I could think about it overnight. We went back the next morning so I could get it, and I'm glad I did. 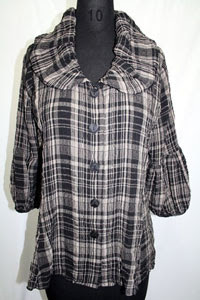 I LOVE the collar detail, the 3/4 sleeve, and the big cuff. It's adorable. After our little visit to the square we went to the movies. And saw Eclipse. Yes, again. And the movie was still not great but the boys were still cute! After our movie we went back to the Avenue and walked around a bit. We stopped at Charming Charlie. Oh. My. Goodness. Have you been there? The amount of accessories in this store is insane. And overwhelming. I feel like I need a Xanax before I go in, and it is difficult for me to find things because there is SO MUCH. I did find a cute pearl(ish) necklace that is similar to a Stella & Dot style I've been coveting. For significantly less than the Stella & Dot version. It's not the same, but it's a suitable substitute. We went to Firebirds Wood Fired Grill for dinner, and it was fabulous. I had the crab cake salad, which I would never think to make as a combination, and it was great! Saturday morning we got up early, ran to Starbucks and then to Kathy's Nail Salon. We got manicures and pedicures, and it was a great salon. It was very clean, which is always a good thing! After nails we went to Sephora. I have been doing my makeup pretty much in the same way since college and needed some tips to freshen that look up. I had a mini makeover and was very happy with the sales associate's recommendations. I got some Smashbox goodies that I'm pretty happy with so far. We had lunch at the Germantown Commissary . Their motto? "So good yu'll slap yo' mama." They're not kidding. This is Memphis BBQ at its best. It is the most unassuming place you've ever seen. You're greeted by a short man who barks, "You eatin' in or gettin' sumthin' to go?" The waiting area for "eatin' in" is about 10 square feet, with one chair. I was standing in the corner made by the chest freezer for pies and the counter for the cash register. It was worth the weird wait. I sent a text to one of the guys I work with while we were waiting, as the Germantown Commissary is his favorite place to eat. He drove the three and a half hours from our office there for lunch one day. He recommended the BBQ Nachos, which I never would have chosen myself. It was a spot on recommendation. This is not healthy food. It is not gourmet food. But damn, is it good. These nachos were amazing. If you're in the Memphis/Germantown area, look it up. I promise you will not be disappointed. It was the perfect end to our little girls' trip. We had a great time, but I was happy to get back to my babies! Sunday we brought Georgia to obedience school, and the boys went to swim at my parents' house. We hung out at home and did some picking up, laundry, etc. Chris finished a little project he started for the kitchen. 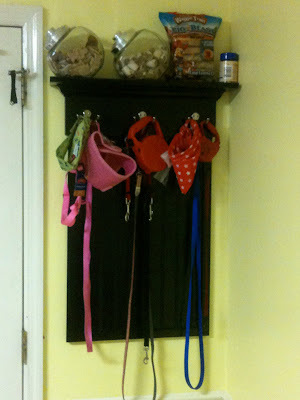 He made this organizer for the dog leashes, treats, etc. He did a great job! I want to get another matching jar or possibly a different set of jars for the shelf, but I'm so happy with the way it turned out. I also have towels being monogrammed to dry the dogs' paws when they come in, and those will hang on the lower portion. I love having a handy husband, because I saw a similar design in a catalogue for significantly more money than this cost us to make. We went Sunday evening to pick up a craigslist desk we got for our room. It's hideous right now, but at $15 was the perfect price. It is cherry colored, with huge gold hardware. I'm going to sand it, remove the hardware, fill the holes, and spray paint it a high gloss black. We will replace the pulls with something more contemporary and it will be perfect. I also had two chairs in my office that were left behind by the old tenants. I brought one home and we will paint that black as well. Before/after pictures coming soon! Robert lived in Collierville his entire life--well until college. It's changed a lot since he left! Rachel I loved Collierville! It was really fun. I have been to the Charming Charlie at the Avenue in the 'Boro. It's very overwhelming. A great concept, but gives me a headache. And I just realized that I used the word cute in this post approximatley 24 times. Not cute. What a fun getaway! I used to live in Collierville. LOVE the town square!! I went to high school at Gtown high which is right around the corner from Gtown Commissary. Yum! Glad you had fun! Love Charming Charlie! Are you surprised? LOL. Collierville is great!